How Long to Cook a Chicken Hindquarter in the Oven? A toaster oven is more versatile than an ordinary toaster. 1 How Long to Cook a Chicken Hindquarter in the Oven? You don't need to go through all the fuss of heating the wall or range oven just to melt a little cheese, reheat some leftovers for your kids or make yourself a midnight snack. If you have a toaster oven, you have a miniature countertop model at your convenience. A toaster oven saves you time and trouble in a pinch, as long as you know the tricks to converting cooking times. Every family has days when time and energy are in short supply. Even if you can’t make an oven-cooked meal, you still have mouths to feed. A toaster oven allows you to deliver something hot and nutritious to the table. As a bonus, you save energy by reheating or cooking in a toaster oven, which can cut your bills. The Wisconsin Energy Corporation says toaster ovens heat up faster than regular ovens and won't make your kitchen sizzle on hot summer days. For fastest cooking times, a convection toaster oven is a worthwhile investment. Convection is a form of radiant-heat cooking in which hot air is forced to circulate. Air circulation results in faster cooking. Without convection ability, a toaster oven cooks by radiating heat from electric heat rods. How the rods cook food depends largely on the quality of the toaster oven. You might have to experiment with it a little bit, but there are a few tricks you can use to speed up the process even with a bargain model. 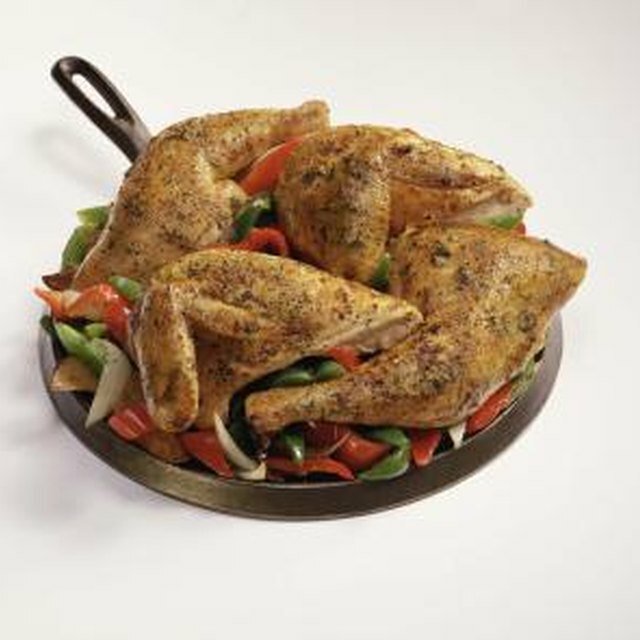 Broil King’s website notes that convection ovens cook food up to 30 percent more quickly than regular ovens. Grab a calculator to convert recipes. Plug in the length of oven cooking time and multiply by 30 percent, and you’ll know how many minutes to reduce the cooking time in your convection oven. For example, chicken legs that normally cook in a standard oven at 300 degrees Fahrenheit for 60 minutes take 42 minutes in a toaster convection oven. The beauty of the convection toaster oven is flexibility. If you'd rather not adjust cooking times, adjust temperature instead. Lower the temperature by 25 degrees. This is a safer option when cooking foods that normally require less than 15 minutes in a standard oven. Fast-cooking foods burn quickly in a toaster oven, so lowering the temperature can help you sidestep a dinner fiasco. A toaster oven with higher wattage, such as 1800, puts out more power than a toaster oven with lower wattage, such as 1100 watts. The only way to determine for sure if a toaster oven is faster or slower than a conventional oven is to test it. Throw in a frozen burrito or pan of brownie batter and time it. If you find the toaster oven’s cooking time is lagging, speed it up a little next time with smart preparation. Heat the toaster oven and defrost food first. Cut food into smaller portions before putting it in the oven. One-inch-thick pork medallions cook more quickly than a 3-inch-thick loin roast. The thing you do not want to do for faster cooking is increase the temperature. The food could end up burning on the outside before it’s cooked on the inside.